Myss Lafunky's Blog: Do You Have A Nom? Hi guys, welcome to a new week. How was last week? Mine was great. Great news upon great news upon great news (I would love to share the news but the owner would most likely not allow me to). If you haven't heard, there's this awesome session happening live on Instagram (IG) led by a minister of God that I describe as a national treasure. If you haven't heard about it, it's called the hallelujah challenge and starts at Midnight (Nigerian time) every day in the month of June on Nathaniel Bassey's IG. If you haven't been a part of it, please join ASAP, you will be blessed. Also take time out to read our post from last week, titled: an oasis in the desert). I'm also pleased to announce to you that your guy Sage is now a technologically advanced reporter. I'm typing my articles on my phone . . . just awesome. Anyways on to the next one. I'm the only one going through this. I can handle it by myself. I alone can resolve this issue. I need to look inwards and sort myself out. I'm sure there are many more and please, feel free to add or remove based on your experience. I have definitely said a few of these statements and even when I don't say them, I think them. What? You thought I was perfect? Naa blood, in the words of the Matrix, I'm only human. Come along, let's see where this leads (to be honest I don't know how it'll end but you can be sure I won't end with ‘Watch out for Part 2’). I got this moniker from a wonderful friend who found a way to mutilate my name and produced Nom out of it. Don't try to guess my name, futile! Anyways, this friend of mine is called Puffy (like Puff Daddy, get it? No?) and Puffy went on and on about how I'm a dependable and helpful person. I never knew I was until Puffy mentioned it and even tweeted: we all need a Nom in our lives and it hit me in my heart; Sage, that's your next article. Thanks Puffy! Basically, a Nom is that person or group of people in your life that's there for you in your ups and downs. Willing to tell you the truth no matter what and willing to advise you in times of trouble. Someone who tries in their little way to encourage you, pray with you and share bible verses that can speak to the situation you're facing. Of course, Nom will also be a friend, a friend that sticks closer than a brother (Pr. 18:24). But be careful, it is not every close friend that we have that can qualify as a Nom. Most times we only need one person, not a group to fill this role. For those that are married, your spouse should be your Nom. For single people, it could either be the person you're in a committed and God-filled relationship with or a childhood friend or anyone. What is important is that they're born-again Christians. Also, if at any point in time you graduate from single hood to marriage, please switch your Nom to your spouse. Why? Watch out for part 2 lol. Why Do We Need A Nom? 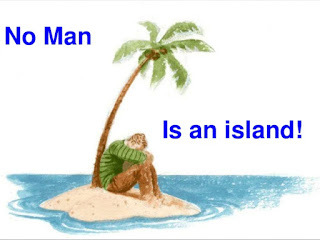 To answer the question why, let's turn to this famous quote from a poem by John Donne: no man is an island. Even before John Donne wrote the poem, Prov. 11:14 and 15:22 tell us that there is safety in counsel. So, even the bible recognises the need for no man to be left alone. Think about it, God in Gen. 2:18 realised that it wasn't good for man to be alone and so He put Adam to sleep and created Eve. The bible is littered with examples of people that had someone that went along on the journey God called them for. Notable examples: Adam and Eve, Moses and Aaron, Esther and her uncle Mordecai, King David and Jonathan, Elijah and Elisha, Paul and Timothy, Mary and Joseph and many more. Jesus had the 12 disciples. Even in modern society, there's the President and the Vice-president. I can go on and on but I'm sure you get the point. All these people needed someone that helped them on their journey towards fulfilling God’s purpose on earth. Imagine if David didn't have Jonathan? Who would have warned David when Saul tried to kill him (1Sam. 19:1-7). Imagine if Esther didn't have Mordecai? Who would have reminded her of her purpose on earth when obstacles came her way (Esther 4:13-14). Imagine if Jesus didn't have the 12 disciples? How would the gospel have been spread? That is why we all need a Nom. This tells us that it is very important that we have someone we can turn to for counsel (Pr. 11:14 & 15:22) on the issues we face in life. Isolation is not God’s plan for us as human beings. The charge therefore to each and everyone of us going into this week is to ensure that we do not allow the devil to convince us that isolation is the best. I pray the Holy Spirit directs us to find our Nom in Jesus name. P.S: The plan was to write next on the Thirsty Soul but while I was in church, I felt led to write on Government and Governance. So look out for next week. Whatever you see is what I've been led to write on first. Also, I'm writing in the dark as there's no light. Saving my fuel for the hallelujah challenge for tonight. Au revoir mesdames et messieurs.